I hope all of you had a good Thanksgiving, full of turkey, mashed potatoes, cranberry sauce, stuffing and at least two kinds of pie. If you happen to not be an American, then well, eat that stuff anyway, it's delicious. However if you are an American and didn't eat that yesterday, then please go move to Canada, you're no longer welcome here. As far as this comic is concerned, it is based on a bit of a true story. While thankfully the apartments I have lived in weren't any higher than a single floor up, some of the dorm rooms I lived were quite high up and had no elevators. 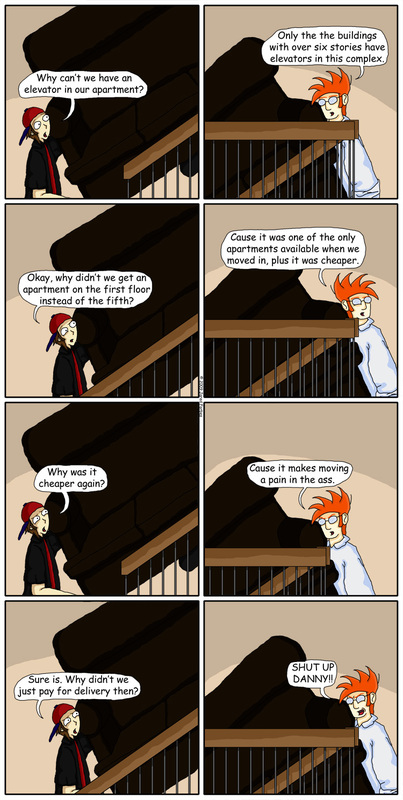 Thankfully I wasn't moving any couches back then; however, still not much fun.